Having worked in finance and having been involved in the design and implementation of consolidation solutions for many years, I would like to think I can answer yes to both these questions. 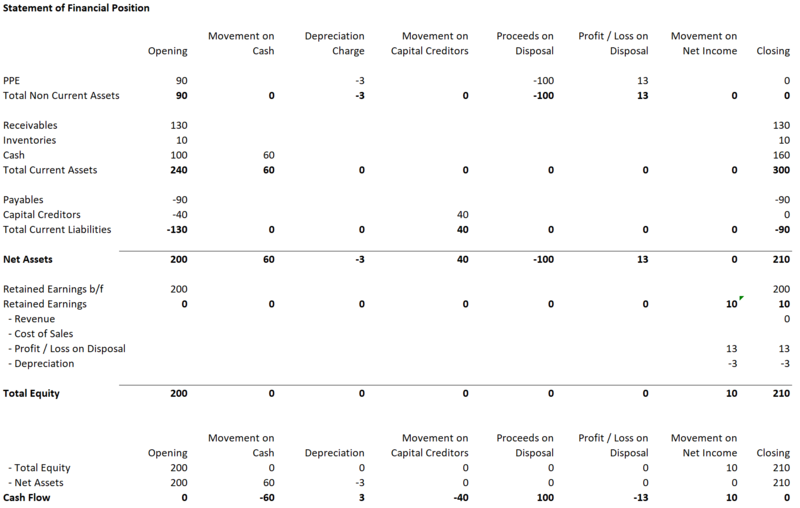 Recently, however, I have spent some time looking at the cash flow design within FCCS (Oracle's Financial Consolidation and Close cloud service product). I can say that the out-of-the-box design concept really does make cash flow simple to explain and to implement. The out-of-the-box design is predicated on organising all balance sheet movements in to a cash flow hierarchy. The underlying concept being: if the opening and closing balance sheets both balance, then the cash flow will always reconcile to net cash. Easy, yes? What could possibly go wrong? As always with cash flow, it is the quality of the information provided that determines the quality of the final statement. Intelligent design of the movements dimension in FCCS will provide all you need to be able to produce a detailed and accurate statutory cash flow. Let me illustrate this by looking at how the cash flow works in FCCS. In the following example, a sale is made giving revenue of £150. The initial journal booked is to credit revenue with £150 and to debit receivables with £150. The posting to the receivables account would be made against a movement member called “Movement on Receivables” while the posting to the revenue account would be made against “Movement on Net Income”. 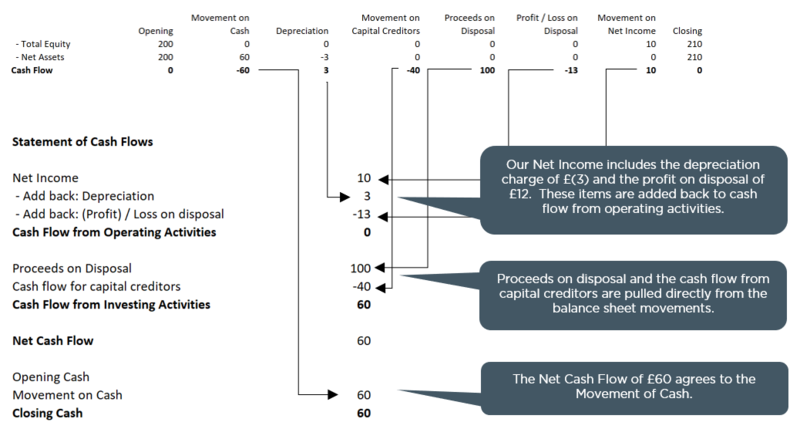 In the illustration above, the “Statement of Financial Position” has a balanced opening position (Net Assets of £160 balancing against Total Equity of £160). 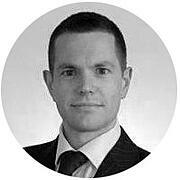 Net Assets is then increased by the “Movement on Receivables” of £150 to give a closing balance of £310. Total equity is increased by the income statement credit of £150 representing the revenue and is seen in retained earnings on the “Movement on Net Income” line. A cash flow can now be derived simply by subtracting Net Assets from Total Equity. In this case, that gives us a “Cash Flow from Net Income” of £150 and a “Cash Flow from Receivables” of -£150; a total cash flow of zero. However, this sale was made from goods within inventory which had a cost of £120. An additional entry is therefore made to debit cost of sales with £120 also against the “Movement on Net Income” and credit inventory of £120 against “Movement on Inventories”. At this stage the customer has not paid any cash for these goods. At the end of month 1, there is a profit of £30 showing against the “Movement in Net Income” line. The receivables account has an increase of £150 on the “Movement in Receivables” line and the Inventory account has a Movement on Inventories of -£120. Again, the cash flow is now simply derived by subtracting Net Assets from Total Equity. In the following month, additional trading occurs giving rise to additional revenue of £80 with an associated cost of sale of £70. This sale was again made from inventory. (The first thing to note is that this statement of financial position shows the movements from month 1 to month 2, and so the opening position represents the closing position from the end of month 1 not the end of the prior year). Also, in month 2 a payment is received for the goods sold in month 1. This gives rise to the first true cash movement. In this case the movement on receivables is the debit of £80 relating to the new sale and the credit of £150 representing the cash received in payment for the month 1 sale giving a total cash flow from receivables of £70. So far so good, but these are easy examples I hear you say. Cash flow is never really this simple. Let’s now look at a slightly more complex example. In month 3, this same company purchases an item of PPE (property, plant and equipment) for £90, £50 is paid in the month and the remaining £40 deferred. 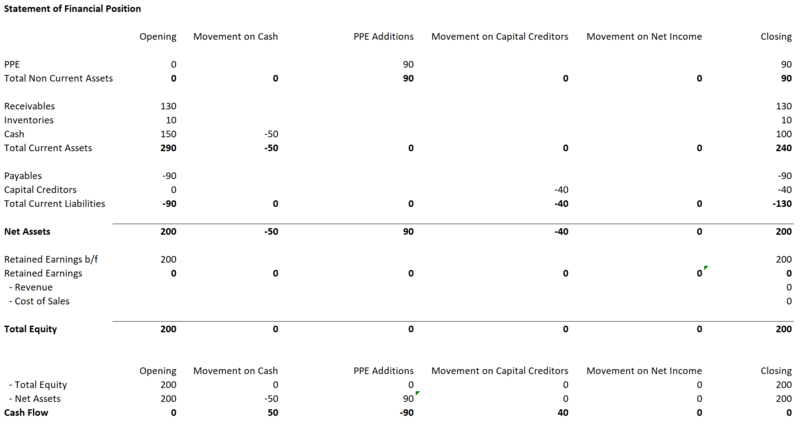 Our statement of financial position now includes additional accounts, PPE and Capital Creditors, also our movement dimension (describing the movement between the opening balance sheet and closing balance sheet) has new members; “PPE Additions” and “Movement on Capital Creditors”. Let’s add more complications by assuming that in the following month, the outstanding balance on the purchase of the PPE is paid, and this same asset was depreciated and then sold. Our depreciation charge is £3, and the asset was sold for £100 with all cash being received in the month. Let’s take each of these transactions in turn. First the depreciation charge. Our income statement shows a depreciation charge of £3 which flows through to Retained Earnings on the Movement in Net Income line and will therefore be included in the top line of the cash flow, Net Income. However, we also see the depreciation amount as a defined movement against the PPE account. 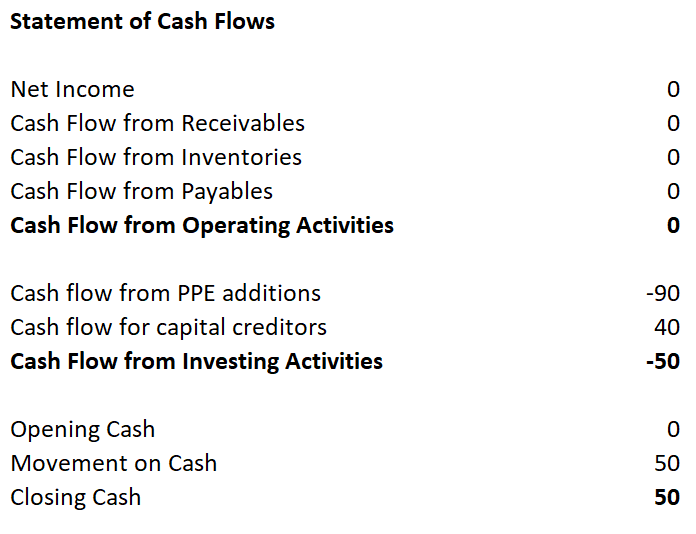 So, this can be added back to the cash flow statement as part of cash flow from operating activities, as this is a non-cash movement. Next, we have the payment of the capital creditor. This is an easy one as this is just a movement on cash offset by a movement on the capital creditor. Finally, we have the PPE disposal. The easy part first: we receive cash of £100 which is shown as a movement on “Cash” and as a “Proceeds on Disposal” movement on PPE. However, the PPE only had a net book value of £87 (the opening balance of £90 less the depreciation charge of £3). This gives us a realised profit on disposal on £13 which need to be a credit to the income statement. Let’s now pull all this together and see if our derived cash flow still works. The important thing to note here is that this cash flow has still been produced directly from balance sheet movements. This has been possible because we were able to identify specific charges and credits in the income statement and disclose these as separate movements against the relevant balance sheet accounts. In other words, we have high-quality information enabling us to analyse the movements on our assets and liabilities. The better the quality of the information, the more accurate will be the cash flow. So how to sum this up? We can attest to the fact that producing a cash flow that reconciles to the movement on cash is simple. 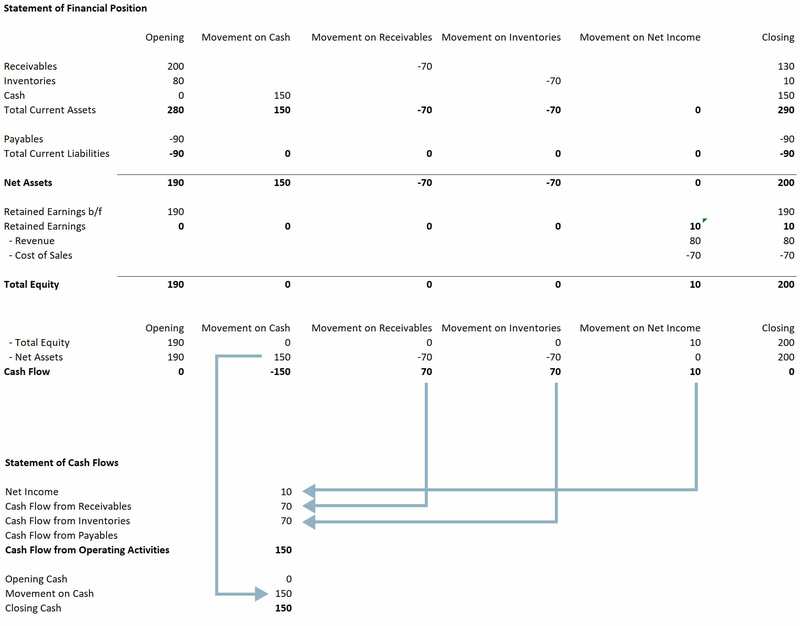 On the other hand, producing a cash flow that reconciles to the movement on cash and correctly allocates movements between operating, investing and financing activities is simple, but highly dependent on the quality of data available. What we are sure of, is that intelligent design of the movements dimension in FCCS gives you all the tools you need to be able to produce a detailed and accurate statutory cash flow. Not everyone is as enthusiastic about cash flow as we are. If you have had enough of wrestling with yours, drop us a line.